It is the best year for a santa fe!! Great mid size truck! I needed a second vech. due to certain circumstance.After much recherche I decided on the 2006 hyundai santa fe, as that model year ALL the issued had been addressed by the mfg. Well, I guess they were Correct. This has been a WONDERFUL truck! A few minor issues,as which you get with ANY used car,but that is it! NO Major/costly issues at all. My BRAND NEW car that I leased had WAY.. more Issues than this has had.! Good car, reliable and roomy! Although this car was used when I purchased it, she is a beauty! A smaller SUV with a V6 engine gives the power you need without all the bulk. Gets good gas mileage especially for an SUV or truck and is easy to drive and handle. Roomy yet feels compact when handling. Would buy again! Had to change ball joints out but other than that, no major issues and she is now 12 yrs old. The gas mileage is very good. We had an issue with the front driver seat movement forward and backwards. It gets great gas mileage. The drive is very smooth and the steering has remained tight since We've owned the vehicle. It is very reliable and has many visible labeled airbags which appear to be in optimal locations. The size of the vehicle makes it a very enjoyable vehicle to take on long trips. 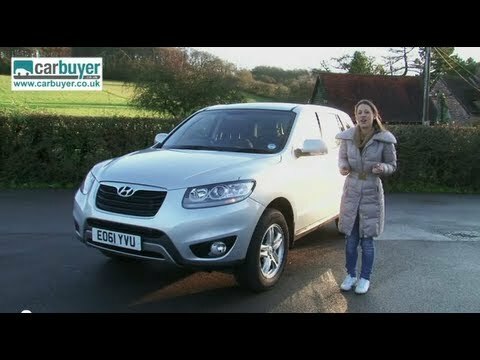 Hyundai Santa Fe Car Review - What Car?